Peter Richardson: Miriam Pawel's "The Browns of California"
I asked to review Miriam Pawel's The Browns of California and am glad I did. My review ran in the San Francisco Chronicle (Datebook section) a week ago, and Miriam has been making the media rounds both here and elsewhere. The New York Times review ran two days ago. 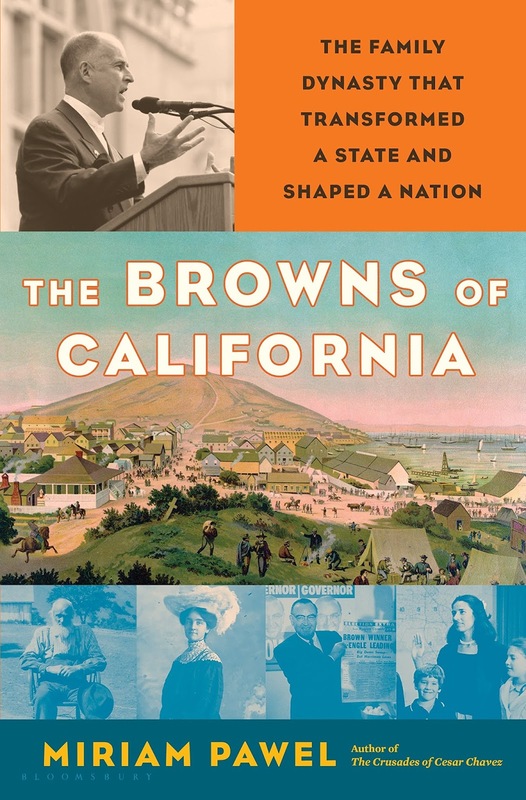 The last sentence is a doozy: "Jerry Brown’s counterculturally-inflected distrust of government has helped make liberal California the poverty capital of America." This is skywriting, in my humble opinion. Perhaps the reviewer is especially attuned to the rise of the right and California's role in that. And I think Governor Brown's urge to run budget surplus (again!) can be criticized both from the right and the left. But this last sentence feels like (oversimplified) score-settling re: neoliberalism, not a comment on Gov. Brown's record. Best friend PG&E ever had.